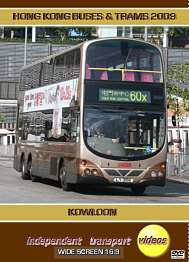 The second programme in our 2009 Hong Kong visit trilogy takes us to busy Kowloon. Situated on the mainland just off Hong Kong island. Filming starts on Nathan Road, the main north - south thoroughfare that carries hundreds of buses every day. Nearly all types of KMB vehicles are featured here including quite a few non-aircon examples still operating on some of the main trunk routes. There are also buses from the fleets of New World First Bus and Citybus. Just off Nathan Road is Jordan Road that leads to the busy Jordan bus station, that is soon to be demolished and relocated to make way for a new development. We record the action here for the last time. Our next location is Salisbury Road and then onto Tsim Sha Tsui bus station. This is the busy bus station adjacent to the Star Ferry terminal. This area is also subject to a major redevelopment in the future, but there is a lot of resistance from the local people for it to remain as it is. Kwun Tong Ferry Pier bus station is our next location. We film here as the buses return from their duties after performing the morning rush. Most of the KMB vehicles are Leyland/Volvo Olympians with Alexander bodies or Dennis Dragons with Duple Metsec bodies in the white air-con liveries. There is also a good representation of non air-con Dragons and Olympians as well. We also see one of the new Scania single deckers on driver familiarisation duties. More filming is done in Kwun Tong before we leave this area for Olympic City located in the western part of Kowloon. Here we observe a good cross section of mostly KMB vehicles including a Plaxton Dennis Dart and buses from the Long Win fleet. Mei Foo is our final location. This exceptionally busy bus station and adjacent roads is just wall to wall buses, mostly KMB, but the other main fleets are well represented. There are still a good number of non air-con vehicles on the ‘30’ group of services as well as new Scania single decks and virtually every type of double decker operated by KMB. We then board brand new Citybus Envrio 500 number 8122 (NZ 3602) on service 102 back to Nathan Road. Enjoy the ride! Duration : 71 minutes (approx).